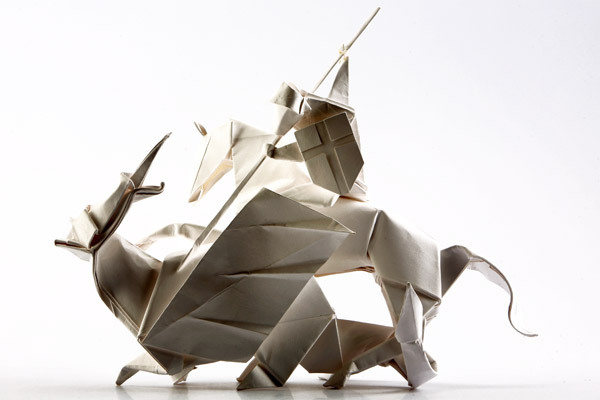 Anyone who took up origami during the last 10 or so years may not be familiar with the names of Paulo Mulatinho and Silke Schroder. The rest of us know Paulo as a gifted artist and paper-folding enthusiast who founded Origami Deutschland in 1989 and traveled the world, meeting creative origamists and using his unique talents to promote origami in Germany and beyond. Silke acted as his creative muse as well as running her own exceptionally well stocked origami store, Viereck Verlag. Paulo stood down as honorary president of OD in 2005 and the couple have kept a remarkably low profile since. H owever, plans were being made. Their enthusiasm for, and vision of the beauty of origami has now found fruit in the Origami Gallery, based in their home town of Freising, a few miles north of Munich. They have rented the apartment below their own and transformed it into a superb gallery, presenting exhibitions of creative and artisitic origami work. Paulo’s natural ability in graphic design means that nothing is spared in presenting origami as it should be, artistically, sensitively and beautifully. I urge you to check out their website www.origami-galerie.de and to invest in the catalogues immediately! They started with a highly-successful exhibition of the works of Vincent Floderer. 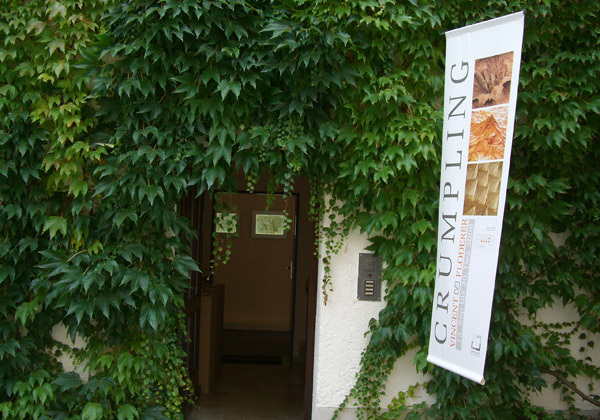 They drove to France to collect Vincent’s finest work, brought it back to Freising and mounted the exhibition, entitled “Crumpling”. Following this have been exhibitions devoted to the work of Annett Deppe, Taro Toriumi und Tomoko Fuse, Ramin Ranzani and the current exhibition, “Confluence” featuring the work of Assia and Dave Brill. For each exhibition, Paulo has produced a superb catalogue of the exhibits, in itself a work of art. You can buy them online from www.viereck-verlag.de.